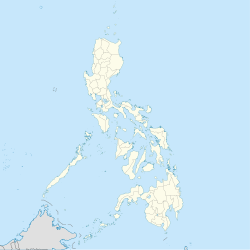 Batan, officially the Municipality of Batan, (Aklanon: Banwa it Batan; Hiligaynon: Banwa sang Batan; Tagalog: Bayan ng Batan), is a 4th class municipality in the province of Aklan, Philippines. According to the 2015 census, it has a population of 32,032 people. Batan was believed to be the seat of the government of Datu Bendahara Kalantiaw III, the promulgator of the Code of Kalantiaw in 1433. The code is a collection of 17 laws used during the time of the Datu before the coming of the Spaniards. Batan is one of oldest towns founded in Aklan. Batan was formerly an encomienda of Miguel Rodriguez in 1591. The parish in Batan was established by the Augustinians in 1601 under the patronage of Our Lady of Immaculate Conception. Batan was first incorporated to Aclan or Aklan (now Kalibo) in 1603 and in 1789 it became an independent municipality. In 1903, Batan was again incorporated to the new town of New Washington and became independent again in 1931. In 1957, the Kalantiaw National Shrine marker was erected by the Philippine Historical and Cultural Society to honor the significance of Datu Kalantiaw where it displays a copy of the “original manuscript” of the Code. It was built in this former school building near the port which houses the province's historical mementos and antiques, including the original manuscript of the code which the Spaniards obtained from an old chief and translated. In 2004 however, after years of investigation and historical findings, the National Historical Institute concluded that the Code of Kalantiaw was fake and a hoax. Remnants of the Kalantiaw National Shrine marker still remain in Batan. Batan is located at 11°35′N 122°30′E﻿ / ﻿11.58°N 122.5°E﻿ / 11.58; 122.5. It is 49 kilometres (30 mi) from the provincial capital of Kalibo and 51 kilometres (32 mi) from Roxas City. According to the Philippine Statistics Authority, the municipality has a land area of 79.22 square kilometres (30.59 sq mi)  constituting 4.35% of the 1,821.42-square-kilometre- (703.25 sq mi) total area of Aklan. Batan is politically subdivided into 20 barangays. In the 2015 census, Batan had a population of 32,032. The population density was 400 inhabitants per square kilometre (1,000/sq mi). Vice Mayor – William Bautista, Jr.
Tinago Lake – also known as Tinagong Dagat, located between the town (near Brgys. Ipil and Tabon) and Altavas. It is an 8-kilometre (5.0 mi) long and 4-kilometre (2.5 mi) wide "hidden sea" hidden from Batan Bay by two islands. Fringed with mangroves and thick undergrowth, it has a rocky beach and is one of the province's rich fishing grounds. It is also ideal for speed boating and water skiing. Ob-Ob Hill – The 200-metre (660 ft) high, rocky Ob-Ob Hill, located east of the Poblacion in barangay Songcolan, has a sweeping view of the Sibuyan Sea, fishponds and rice fields. At the foot of the hill is a beach ideal for underwater cave divers and water sports enthusiasts. Kalantiaw National Shrine Marker – a historical marker named after Datu Bendahara Kalantiaw III, third chief of Panay, who instituted a legal code here in 1433. Mambuquiao Marine Protected Area and Fish Sanctuary – an existing reef turned into a fish sanctuary. Locally called pito, it has the highest live coral cover in Salian Bay. It is ideal for snorkeling and scuba diving. Batan also has several beaches, abundant marine life, seafood (Batan is known for its crabs, lobster, and shrimps), coconut products, grain produce, root crops, fruits and large forests. Santo Ninohan or Ati-atihan and Malakara Festival (in honor of the Holy Child) — celebrated every third Saturday and Sunday of January. This festival is similar with the well-known Ati-atihan of Kalibo. Its difference from Kalibo's Ati-atihan is that participants are required to use native and indigenous materials as the main component of their costumes. Juez De cuchillo – held every 19 October to commemorate the capture and beheading of 79 innocent civilians in Batan on October 19, 1943 by the Japanese Imperial Army. A simple program is always held at the site of the building where the victims were slaughtered. A marker was established by local official and relatives of the victims of Japanese atrocities. ^ a b "Province: Aklan". PSGC Interactive. Quezon City, Philippines: Philippine Statistics Authority. Retrieved 12 November 2016. ^ a b c d e Census of Population (2015). "Region VI (Western Visayas)". Total Population by Province, City, Municipality and Barangay. PSA. Retrieved 20 June 2016. ^ "Batan". Aklan Directory. Retrieved on 2011-11-03. ^ "Aklan Tour - Batan" Archived November 5, 2011, at the Wayback Machine. Panublion. Retrieved on 2011-11-03. 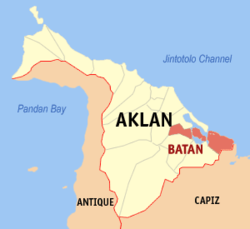 ^ "Municipal: Batan, Aklan". PSGC Interactive. Quezon City, Philippines: Philippine Statistics Authority. Retrieved 8 January 2016. ^ a b Census of Population and Housing (2010). "Region VI (Western Visayas)". Total Population by Province, City, Municipality and Barangay. NSO. Retrieved 29 June 2016. ^ "Province of Aklan". Municipality Population Data. Local Water Utilities Administration Research Division. Retrieved 17 December 2016. Wikimedia Commons has media related to Batan, Aklan.